One of my favorite wines from the Rhone valley. When asked to describe a textbook example of Chateau Neuf du pape this wine would be a good teaching tool. 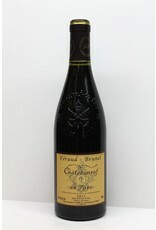 It uses the three main grapes of the Southern Rhone, grenache, syrah and mourvedre. Each of these grapes adds a different component to create the overall character. The grenache provides the bright fruits, the syrah the earthy undertones and the mourvedre the dark fruit backbone. This wine is medium bodied yet big enough to work well with game and duck. Try this and understand why Chateau Neuf du pape is so well regarded.